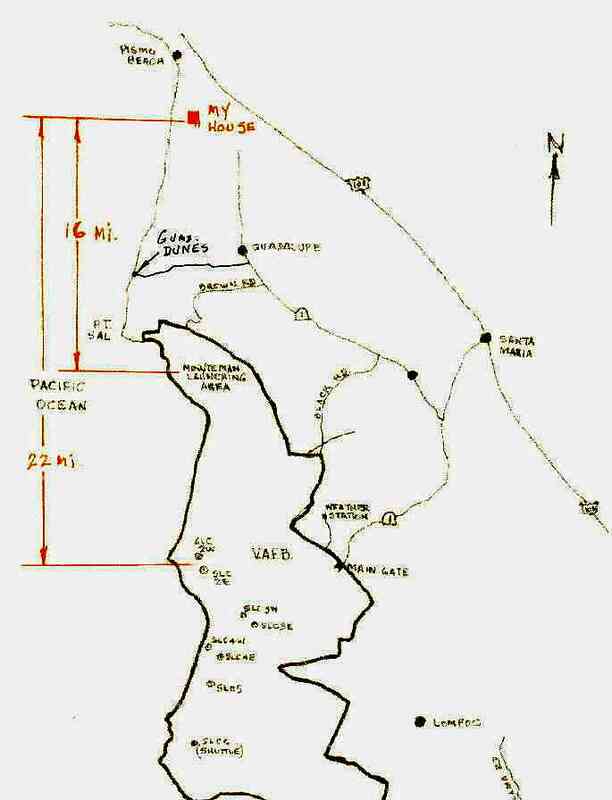 The 10/2/99 Minuteman II launch turned out to be an ideal viewing opportunity for anyone within approximately 300 miles of Vandenberg Air Force Base. It took place at precisely the right time, 5 - 10 minutes after sunset, and under nearly ideal weather conditions. 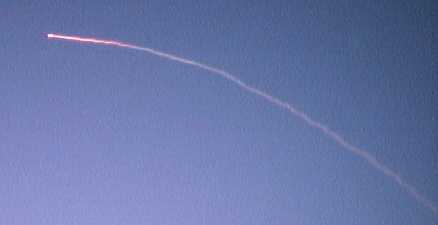 This launch was a test of an ICBM defense system. The Minuteman carried a dummy warhead (and at least one inflated decoy). 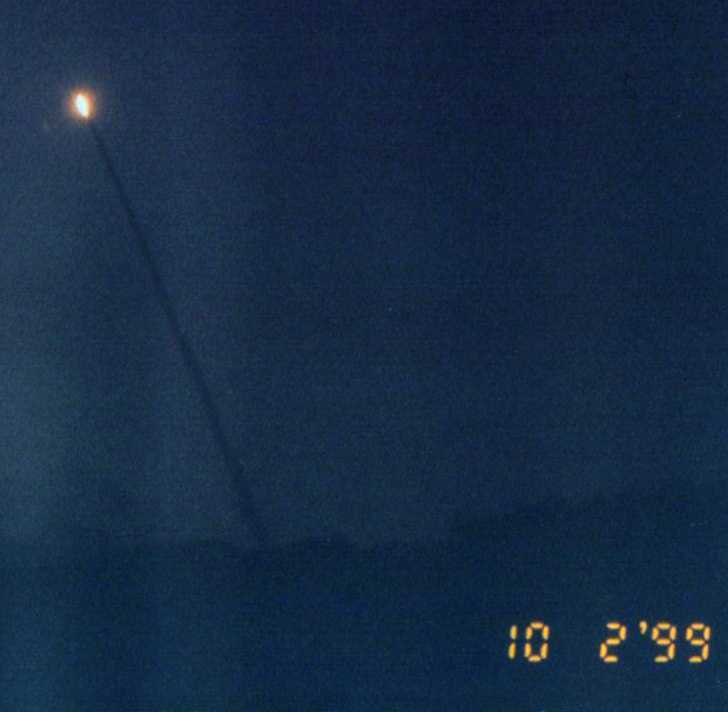 An interceptor missile was launched from the Marshall Islands about 20 minutes later, and impacted the warhead 10 minutes after that, 140 miles above the Pacific. The vehicle climbed into the sunlight, and its exhaust trail lit up bright white. 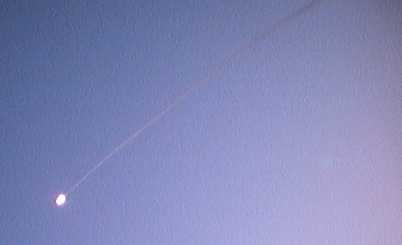 As it climbed above the atmosphere, even though it was hundreds of miles away, the expansion rate of the exhaust was amazingly apparent, especially at staging. We were on the North side of the base near an access gate, the Minuteman appeared from behind a small hill. It was incredibly bright and loud. As it gained altitude it left a very vivd red, white and blue trail. It certainly made the drive to Lopoc worth it. Marc and Ron Röhrenbacher have also provided a series of video clips. Try 'em out and let us know what you think. Five friends from the bay area came screaming down here Saturday at the mere mention of a rocket launch, We went down to Guadalupe Dunes Beach about 2 miles north of Point Sal and 4 miles Northwest of the launchsite; much closer than the media viewing area next to the weather station which looks to scale out at about 8-9 miles away (see map). Low foggy clouds were threatening to cover the whole area, but thanks to my visiting guru, we were able to maintain reasonable visibility until after the launch. The only part we missed was the blast-off which usually is a bright orange. Due to one large dark gray blob sitting right on the ground between us and the launch pad, we didn't even see a hint of a glow. Precisely at 7:01:05, the rocket appeared just over the gray blob and we had a beautifully clear view until it went out of sight. The sound followed the rocket by about 10 seconds. 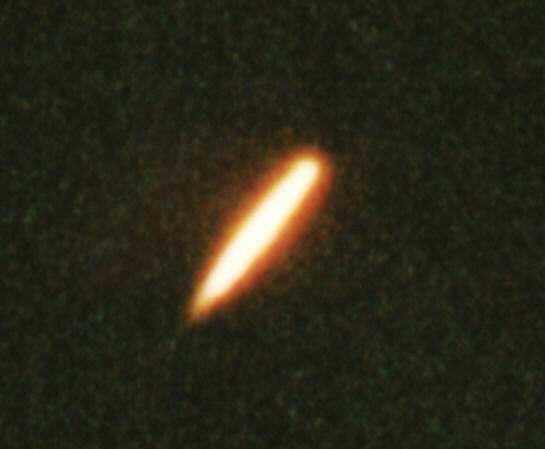 Jean Noel sent back some selected frames from his camcorder, two showing the firing of the second and the third stage. We had the entire beach to ourselves, except for several surfers leaving for the day. The demonstrators were over at the main gate of Vandenberg. 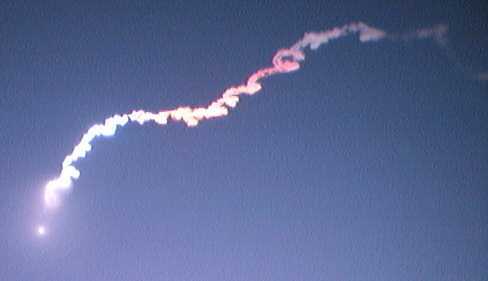 This was the first actual launch, (not just the resulting vapor trail), that I've ever seen. It was spectacular. 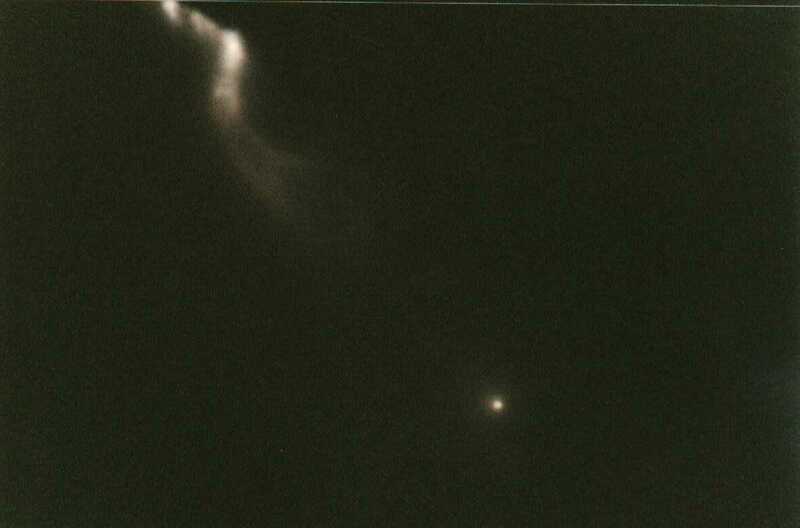 The rocket exhaust varied in shape from a narrow comet like tail to a wider rounded fan then almost spherical cloud. It was beautiful. We saw the moment when the final burn ended. Just before that something that looked like a spherical shock wave propagated rapidly from the rocket. Shortly after burnout the oxygen above the main vapor trail began to flouresce an auroral green which became brighter and larger in the darkening sky, eventually spreading over Arcturus and much of Bootes before fading out. 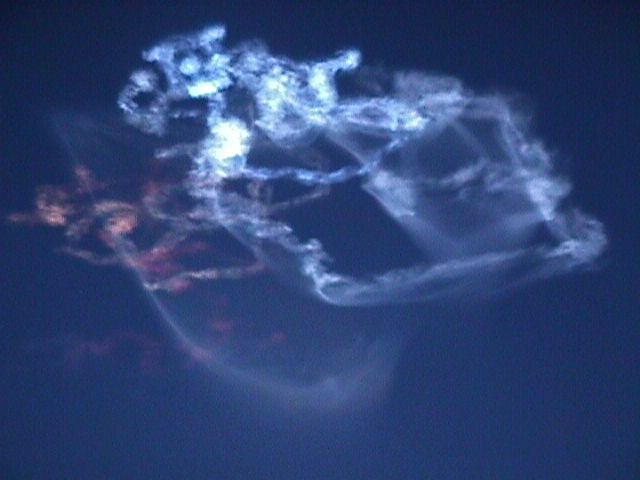 Meanwhile the vapor trail exhibited the usual, dazzling display of vivid color. A friend had come over for an observing session with my telescope. After MECO, we turned the scope on the trail and were awestruck by the beautiful colors and lovely turbulent detail in the trail. 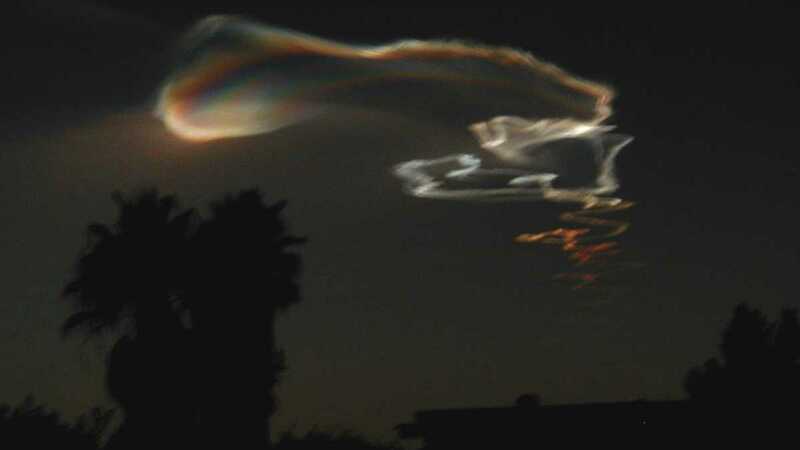 Stars could be seen glimmering in the multicolored cloud. Some portions of it resembled the turbulent clouds of Jupiter, while other regions were banded looking like a closeup view of the rings of Saturn. 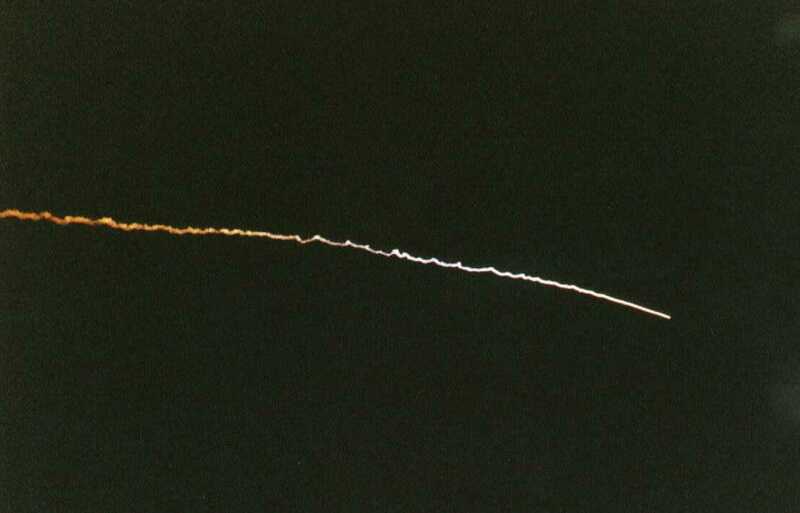 Not long after the launch, we saw the brilliant flare from Iridium 60, high in the southern sky at 19:07. It was magnitude –8.0...very bright. 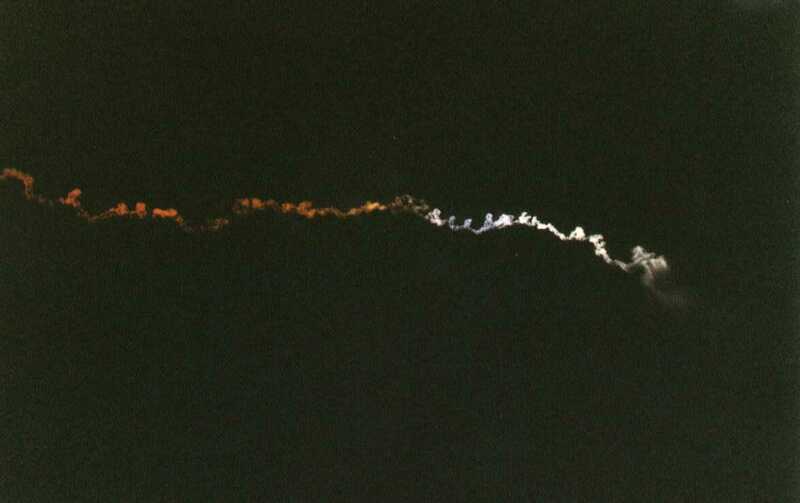 We saw the Resurs 01 rocket, the Meteor 1-31 rocket, and then Mir at 19:41. Quite an evening for rockets! Image taken by Bill Reinthaler in Bishop, CA.